“Bennelong is in all of us, as we navigate the ancient and modern elements of our lives”. These words of choreographer Stephen Page in the program for his latest dance biography of the man who probably called himself Wollarawarre, but whom we know as Bennelong (Big Fish) after his skills as a fisherman, reveal just a hint of the importance Page gives the man and the trials of his life. For there's a strong sense of self-identification between the choreographer and the fully-tribal Wongal man who became such an interlocutor between the English invaders and his own Eora Nation that the former built him a house on the great meeting place of the latter – now Bennelong Point – though he may well have been rejected by the latter for 'selling out', turning to drink and being buried by white people in the grounds of Sydney's first brewer, James Squire. So an inherent sympathy for the boundary-crossing Bennelong, who may have been seized and chained by Governor Phillip initially, but went on to thrive on many of the novelties offered by the Brits, and willingly took an amazing Moon-shot voyage to London, returning to the virtual rejection by his own family and those of his people who'd survived the smallpox epidemic that had struck only a year after 'Australia Day' 1788 – dining with the governor rather than living the Wongal life and fishing. Such complexity. But how to show it in dance? I was reminded of Graeme Murphy's heroic career at the Sydney Dance Company, where I'd often thought that he found making abstract dance easier than inventing narrative dances. I suspect Page may be the same. I've always raved over his original Ochres, where he delved movingly into the mythic and Blak, where his take on Indigenous urban problems was angry and powerful without requiring any particular story. 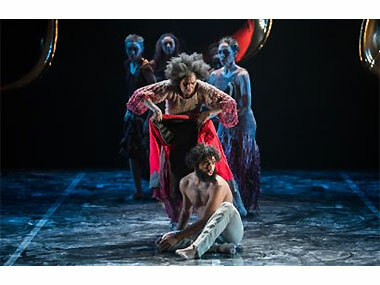 Bennelong certainly required a story, and Page gathered collaborators to assist – dramaturg/poet Alana Valentine; cultural consultant, Tharawal man, Matthew Doyle, whose local understanding and language contribution now feel so much deeper than his 1997 work, Wirid-Jiribin; composer Steve Francis, both benefiting and burdened by his inheritance from the late David Page, the absolute creator of the Bangarra sound that fearlessly crosses from remote tribal to close-by night-club; designers Jacob Nash (set), Jennifer Irwin (costumes – how many shows has she done for Bangarra now?) and the veteran Nick Schlieper (lighting), and, of course, the dancers. 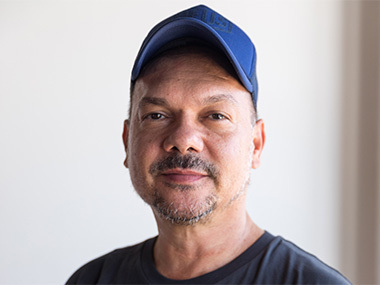 No fewer than 18 were on stage, all Indigenous and increasingly trained at schools like WAAPA and QUT, even L'Ecole-Atelier Rudra-Bejart in Switzerland, though half have also gone through NAISDA and several the Aboriginal Centre for the Performing Arts in Brisbane, the two dedicated Indigenous academies. The story came as chronological, from a gender-defined tribal world in which the men leapt lightly (carelessly?) through a symbolic smoking circle to an ending in which Beau Dean Riley-Smith's Bennelong was increasingly hemmed in a silver-mirrored padded cell, leaving one despairing hand waving as our last sighting of this hero/anti-hero. Riley-Smith offered a slight, bearded figure – which is odd, as I've never seen a bearded image of Bennelong and the production itself used the so-called Port Jackson Painter's contemporary, beardless portrait “as painted when angry” at the end. In fact, he looks wonderfully innocent, which is not inappropriate for a man who was open to so much discovery without having any notion of its consequences to his 50,000-year-old lifestyle. Throughout, we are swept through seamless episodes in which Bennelong is born and washed by the women as his five names are intoned; in which traditional armpit sweat is accessed to 'vaccinate' against the oncoming tsunami, fear in the cast's eyes; some superb drumming to accompany the hostility as the invaders arrive, with a clash of unappealing odours as the parties are forced to interact. All too soon, Bennelong is blandished with European clothing – though others reject the red. Later, after the smallpox epidemic, shown as Aborigines now pass through a smoking, rectangular (Enlightenment?) frame and expire, all Western clothes are discarded to form a red, white and blue heap. Nice. The famous ceremonial spearing of Phillip and Pemulwuy's resistance largely passed me by, though the accompanying soundtrack moved from Patyegarang's Eora word-list from the Dawes Diaries to questions in English, basically “Is Bennelong a fighter or is he a quisling?”, so that his dilemma is clear to us if not to him. His wife Barangaroo – that other Harbour Point – does a Lady Macbeth on us, the excellent Elma Kris wafting through death with a smoking coolamon, cruelly juxtaposed against a dervish ball in distant London to the strains of Haydn's Farewell Symphony. Bennelong returns to his five, unappeased wives – their gendered role reflected by five blood-stained kuckles (shells) descending from the heavens. The end is nigh. The dancing, visuals and soundscape were all powerful – though the stage is perhaps too crowded too often for clarity of storytelling. As a result, I fear I didn't really engage emotionally with Bennelong's dilemma, and both Elma Kris's Barangaroo and Daniel Riley's Governor Phillip failed to emerge as characters against whom Riley-Smith's Bennelong could bounce. But in terms of raising awareness about the human consequences of pitting one civilisation against such an alien one both in Sydney (on the very site in the Opera House where the clash occurred) and then around the country (where the show will travel until September), Bennelong is an evocative and important experience.